Saw II & III director Darren Bousman's remake of Mother's Day has been rushed into production fairly quickly. It was only five months ago that we first learned it was even happening and now Bousman is already shooting this up in Canada. Darren just posted the first official photo from the remake on his Twitter today. 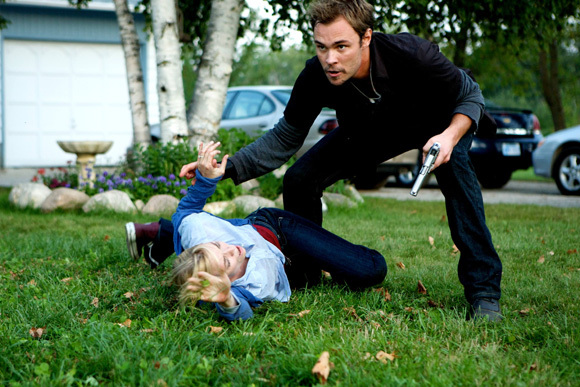 It's not a behind-the-scenes shot but rather an actual photo showing Patrick Flueger (I think?) wrestling with what looks to be Jaime King. Either way it's a pretty dynamic first look at the movie, although it doesn't show much (in terms of story). Bousman also debuted a behind-the-scenes first look on IGN today as well. This remake, written by newcomer Scott Milam, will see the villainous family return to the house where they grew up and terrorize the new owners and their guests. The story will reflect today's times and the rough economy. "She's lost her house… Her boys are going to get it back to her." Rebecca De Mornay stars as the evil mother. The rest of the cast includes Jaime King, Briana Evigan, Alexa Vega, Deborah Ann Woll, Shawn Ashmore, and Matt O'Leary. I'm excited for this mainly because Darren Bousman has never let me down (yes, even with Repo! The Genetic Opera). I'm sure we'll hear more from Twitter as they continue shooting. they need to remake American Gothic if they are gonna remake those old twisted family type movies.